"Your mind is precious! It is sacred. Therefore, the education of one's mind is also sacred. Indeed, education is a religious responsibility. Of course, our opportunities and abilities will vary a great deal. But, in the pursuit of one's education, individual desire is more important than is the institution you choose; personal drive is more significant than is the faculty. 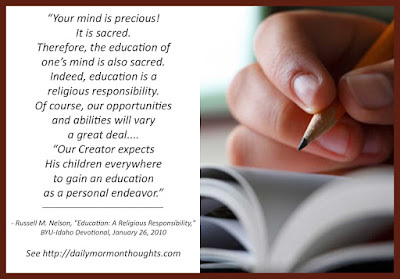 "Our Creator expects His children everywhere to gain an education as a personal endeavor. He issued this commandment: 'Seek ye diligently and teach one another words of wisdom; yea, seek ye out of the best books words of wisdom; seek learning, even by study and also by faith' (D&C 88:118; emphasis added). When you leave this frail existence, your material possessions will remain here, but the Lord has declared that the knowledge you acquire here will rise with you in the resurrection (see D&C 130:18-19). In light of this celestial perspective, if you impulsively drop out or otherwise cut short your education, you would not only disregard a divine decree but also abbreviate your own eternal potential." Do we truly demand the highest expectations of ourselves? President Nelson was speaking in these remarks to college-age youth about the importance of their educational pursuits, but the principles go beyond the formal period of education and preparation that normally occurs at that age. They are eternal. To say that "education is a religious responsibility" is an ongoing obligation for each of us. So it's the "personal endeavor" of education that we must continue as a priority in our life. We must continue to "seek words of wisdom" from "the best books" in our personal lives. We must seek wisdom and learning—a very active and ongoing charge to each of us. 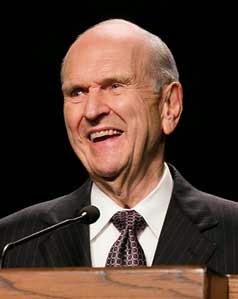 That is the continuing path to our "eternal potential" that President Nelson, and the Lord, hope we are pursuing.